↑ "Cadeiras sao retiradas do Maracanã para conclusao da primeira etapa das obras pra a Copa do Mundo – Chairs are removed from Maracanã concluding the upgrading first step". Noticias.r7.com. 1990-01-06. Retrieved 2011-10-09. ↑ "Key issues addressed at Brasilia meeting". fifa.com. 2012-06-28. ↑ "Organising Committee for the FIFA World Cup extends its responsibilities to cover 2018 and 2022". fifa.com. 2013-03-19. ↑ "Pot 1 seeds set for Brazil 2014 draws". FIFA. 17 October 2013. ↑ "赛事 schedule for 2014 FIFA World Cup™ unveiled". fifa.com. 2011-10-20. 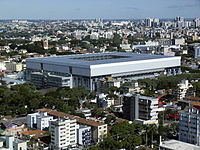 ↑ "FIFA Executive Committee approves kick-off times for Brazil 2014". fifa.com. 2012-09-27. ↑ ༡༠.༠ ༡༠.༡ "Regulations – FIFA World Cup Brazil 2014" (PDF). FIFA.com. ↑ "赛事 schedule for 2014 FIFA World Cup™" (PDF). fifa.com. 2013-04-22.